Florence Henderson sang "My Buddy" to me when she appeared on radio with my dad and Mark Samansky. Mark put the performance to an electronica beat, and you can hear an MP3 by clicking here. I have a three-legged friend who's now living a happy life with Mom & Dad's pal Gail Blank. Braveheart romps with Kiva. His other sibs, Ki, Imzadi and Angel, have since gone to the Rainbow Bridge. 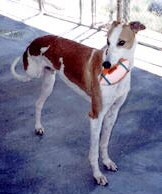 Gail's site contains an educational greyhound section, plus a tribute to horses. UPDATE: Braveheart went to the Rainbow Bridge in 2007. Fred has gone to the Rainbow Bridge at age 12. 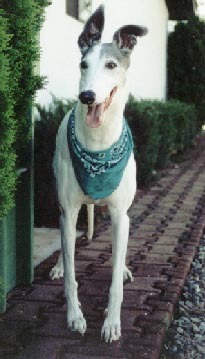 He adopted Ann Appel, who, even after moving to the California coast, still contributes her expertise to the Colorado Greyhound Adoption group. In his younger days, Fred helped save lives by donating blood through the Denver Veterinary Blood Supply program at Wheat Ridge Animal Hospital, the only veterinary facility that offers 24-hour, full service animal blood banking for Metro Denver. The demand for life-saving blood products continues to increase and new donors are being sought to help meet these needs and save more lives. 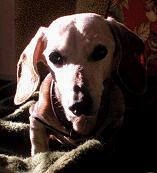 Farewell to my good friend and former roommate Schatzi the Dachshund. I first met her in the hotel where her dad, Ace, and my dad were put up during the start of a new radio station in Colorado. Ace took good care of her - she lived to be 21 years young! This is an adopted sweetie from Sierra Vista, Arizona. Empire's human, Jean Walker moderated the GreyhoundCrazy group at Yahoo and put together the informative web pages for a Sierra Vista adoption group. 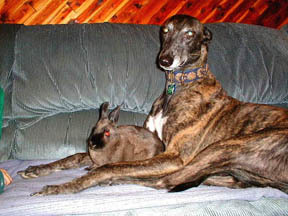 Yes, most greyhounds are pet-friendly, sometimes even if those pets are rabbits! This is my cyber-pal Buster the Greyhound. Be sure to visit his web page on the site he shares with his mom, Debbie. A lot of media-types like Mom and Dad have found greyhounds to be wonderful companions. A greyhound cyber-pal of mine, PDQ, adopted to Kevin "Crash" Davis, a radio program director. Shown here at the Grand Canyon, PDQ - who was renamed Petey - was a loyal, loving friend to Crash when he went through a divorce, and enjoyed traveling 2,000 miles with him to a new radio job. Here are some more cyber-pals! From left to right are Vanity, Chance and Rufus. 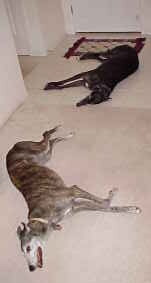 All three are former racing greyhounds, retired from Lakes Region Greyhound Park in Belmont, New Hampshire. 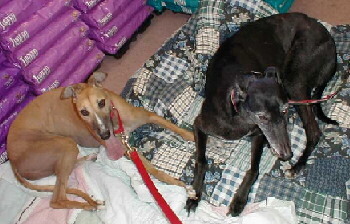 They were adopted by Kate Binder and her husband through Greyhound Placement Service of New Hampshire. Corky & Laddie Gib live with Jan & Ken, who are great friends to all dogs everywhere. Ken did the AT&T Broadband video segments for the Central California SPCA and made the pictures of the adoptable cuties on the CC/SPCA website, which Mom & Dad created and maintained when we lived in California. Laddie Gib gets his name from G. L. "Gib" Rambo, the longtime Executive Director of the CC/SPCA. 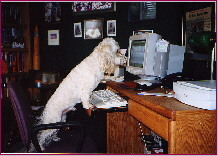 Here's Sherman the Wonder Dog, a cyber-pal who contributed to my Fun Page. Sherman's dad Dave was credited as head honcho at TM Century, a professional media services company in Dallas, but as you can see, it was really Sherman who did all the work and made all the decisions. In the foreground is sweet Missy Gal, who adopted Howard & Betty through El Paso's adoption group. Missy was an abused racer/breeder and became a happy, smiley dog since finding a loving home. While our humans were gathering for brunch, Missy & I decided we'd have our own little slumber party. Sadly, Missy, who had long-term complications from her injuries, went to the Rainbow Bridge during the 2004 holidays. 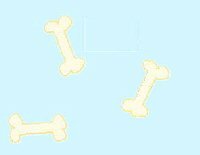 You humans have advice columnists for the forlorn or perplexed, but where do you turn for pet advice? Well, should you have a question, point your sniffer in the direction of Dear Aggie, the mother of all four-legged advice-givers. This site is a real howl! Here's photographic evidence that Gypsy & Buddy held paws at a show & tell in El Paso. Was it true romance or a passing fling? Neither of them are talking. This photo was taken by Gypsy's mom, Laurel. You can enjoy Gypsy's Journal by clicking clicking here.